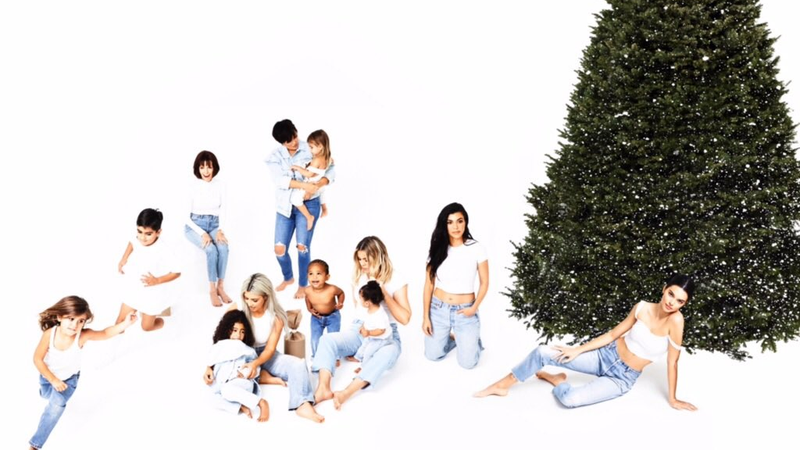 After waiting patiently through 25 days of faded blue denim, white tops, and a Christmas tree harvested from The Polar Express’s uncanny valley, Kim Kardashian finally revealed her family’s full Christmas card. But the final photo, published Monday night, did not contain what many followers had expected since day 1: a photo of Kylie Jenner showing off her baby bump. Perhaps we were dumb to be played so masterfully. Perhaps we were dumb to even care about a family’s “25 Days of Christmas”! (Which is definitely not a thing outside of holiday TV scheduling, by the way.) But the frustration for those of us who still find some semblance of pleasure in keeping up with this wretched family remains, and Jenner has yet to comment publicly about her alleged pregnancy. Maybe the big reveal—if it ever actually happens—will take place on New Year’s Eve. Or New Year’s Day! Or maybe we won’t know until two years from now, when Kim uploads a video of the previously unseen child in F/W 2019-2020 Yeezy kidswear saying, “Hi Earth, I Kylie’s baby.” Then we’ll have to wait until the following Christmas to learn its name. The day after Christmas is a slow one for gossip: Exhibit A. The day after Christmas is a slow one for gossip: Exhibit B.